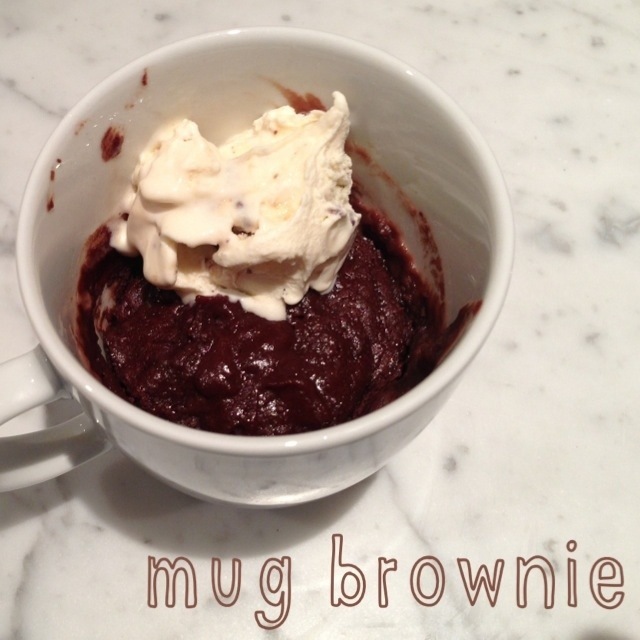 mug brownies | Is there any wine left? Whit was in rural Mississippi most of last fall for work so I had lots of solo meals. I feel guilty even proceeding to complain about all of the eating alone because I had access to a full kitchen and Whole Foods, while Whitney had to choose between Waffle House and Piggly Wiggly for every meal. But complain I will because cooking for one isn’t always the easiest thing. Portion sizes, do you hear me? One night after dinner I was craving something sweet but didn’t want to make a big dessert as I knew I’d just end up finishing it myself. I googled “individual dessert” and a million results for microwaved desserts in a mug came up. You can make any number of desserts, start to finish, in less than three minutes. Dangerous knowledge. In a coffee mug, combine all ingredients. Microwave for a minute and 15 seconds. Allow to cool slightly then top with ice cream or whipped cream.